Congrats to Ed for a great talk at the Graduate Research Seminar. Jorge's paper on the biosynthesis of terminal alkyne amino acids appeared in Nature and was featured in C&E News. Congratulations to Jorge, Monica, Maddy, and Chia-I! Congrats to Jorge for a great talk and to Monica for best poster award at the Asilomar BBS retreat! The Chang group welcomes CBGP rotation students Eli Kissman and Max Sosa. The Chang group welcomes new graduate student Doug Millar (CBE). The Chang group welcomes visiting undergraduate Laura Turner (Berkeley-Oxford Exchanges in Chemical Biology). Congrats to Jorge for a great talk at the CBE Colloquium. The Chang group welcomes CBGP rotation students Kim Houghton and Mira Liu. 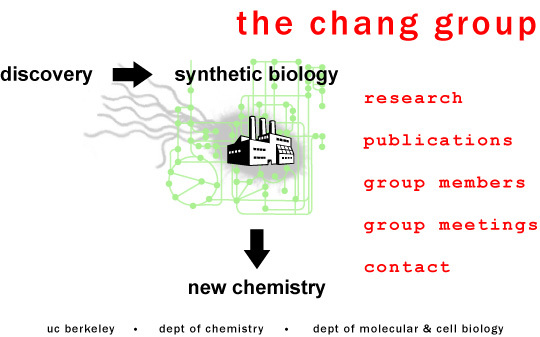 The M. Chang group website now has a news feed!